My number one priority is to provide the best possible service. I understand that your time is very valuable. One of the most common complaints I hear is that "other" pressure washing services aren't reliable. You can count on me being at the job site on time and ready to work. Keeping and satisfying my customers is how I have been able to stay in business for years. I want to become the only one you call for all pressure washing needs. I live in New Tampa Florida, But I am more than happy to offer my pressure washing services in Wesley Chapel, Land O' Lakes, Lutz, Dade City, Zephyrhills, San Antonio, and Tampa. 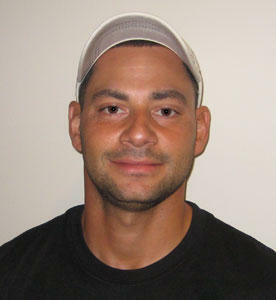 I have been professionally pressure cleaning homes since 1999, and my experience is paramount. I know your home is your most valuable asset, so you can trust that it will be treated with care. I am here to answer any questions that you may have about the process and the cleaning techniques that will be used. Delgado Pressure Washing is licensed and insured. 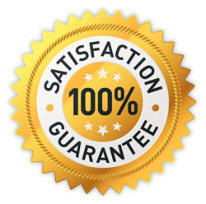 I give a 100% satisfaction guarantee on all my pressure washing services. 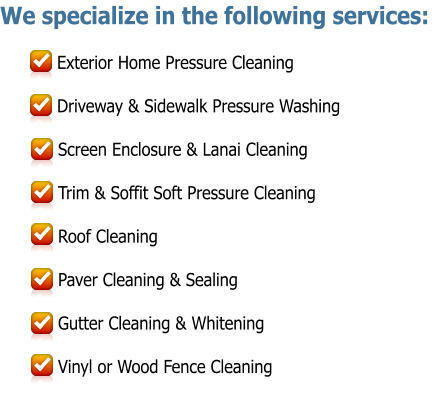 Pressure cleaning homes, driveways, sidewalks, roofs, screen enclosures, trim/soffit, fences, patios, lanais, and much more.